ESTATE SALE- This is an âABSOLUTE AS IS LISTINGâ with right to inspect. The Personal Representative will not spend any additional money for repairs or maintenance. This Beautiful waterfront home located in the highly sought-after Isle of Capri community on Treasure Island was built in 1971 and features over 1600 square feet of living space. 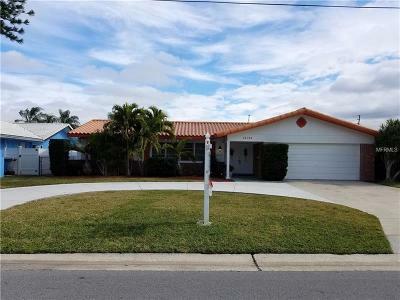 With a split floor plan 3 bedrooms /2 baths an air conditioned 2 car garage and a huge deep-water swimming pool this home is rare find. The 8'x7â foyer opens onto the 17âx 13â living room which opens onto the dining room which measures 10âx 10â. The dining room has sliding glass doors onto the 20âx12â covered porch which gives you plenty of room for parties. The large family room measures 21âx 12â and also opens onto the covered porch area. The 13âx 10â galley kitchen separates the dining room and family room and has a pass-through window onto the covered porch area. The master bedroom measures 15.5âx 11â with a walk-in closet and a 11'x7' master bathroom. The 2nd bedroom measures 13.5âx 10â and the 3rd bedroom also measures 13.5âx 10â. With a 22âx 19â finished garage which is air-conditioned and includes the laundry area this house has plenty of storage capacity. The back yard is almost entirely covered by the full size in-ground deep water pool the pool deck and a shuffleboard court. Buyer and Buyer's representative to verify all room sizes dimensions and zoning restrictions during due-diligence/inspection period.